Justin Bieber has become the victim of an elaborate April Fool's Day prank. You wouldn't call it the final indignity for Justin Bieber – no doubt there's further to fall for a man already earning frequent offender points at his local cop shop. However, being the victim of an elaborate April Fools' Day prank may be seen as rubbing high end rock salt into a well-groomed wound. 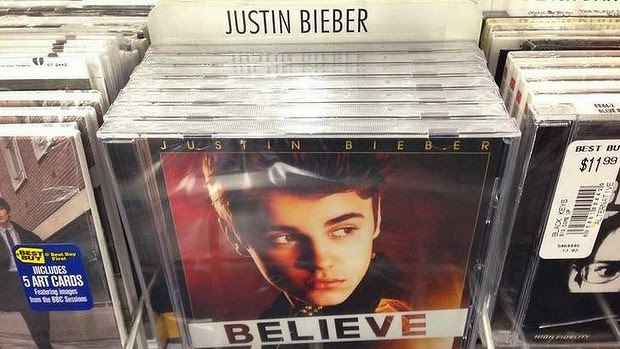 Across Los Angeles on Tuesday, what appeared be copies of Bieber's Believe album on the shelves of major retailers such as Wal-Mart, Best Buy and Target turned out to be music from electronic artist Paz. While the cover was identical to Believe CDs, which were plastic-wrapped and a barcode visible on the packaging, the actual disc instead featured music from Paz's album, From the Bottom Of My Heart To The Top of Your Lungs. Although the title of the DJ's record may be seen as a reference to Bieber's seeming predilection for inhalable substances, musically it's heavy on the synthesisers and light on the teen-friendly pop for which the Canadian star is best known. For those playing close attention, a giveaway before the music was played would have been the inside sleeve of the CD which not only had the regular Paz artwork but also what's described as "images of cats, pizzas and a dog stuffed inside a taco”. Not even an artist with the biggest case of the munchies would go so far as a dog stuffed taco. Probably. Paz, whose full name is Paz Dylan, said the hoax was not lightly done and had a message well beyond any passing mockery of a fallen pop idol. "We paid a lot of attention to detail because we wanted these to stay up on shelves as long as possible," he told the Associated Press. "The general idea is that retail stores make it almost impossible for independent musicians to get their music in there. I've always believed that retail stores can be the best outlets and ambassadors for independent music. They just choose not to be and sell the same recycled [expletive]. We thought if they're going to lock their doors to independent musicians, we're just going to knock them down and get our music in there." Although some media were able to obtain copies of the hoax album, it's not known how many, if any, were purchased by unsuspecting Beliebers. Nor is it known how many found the music an improvement.